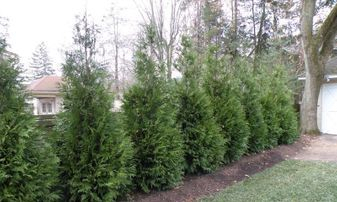 Green Giant Thuja plicata This is one of the fastest growing hedge trees you can buy and takes very little care. Perfect for those that eventually would like to block out taller visuals (2nd story decks or windows, elevated houses or roads) Green Giant Thuja plicata also do well in heavy snow loads due to there great flexibility. Deer do not touch this species and they are very resilient to pest and drought. 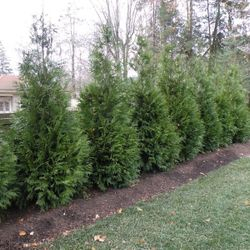 Green Giant Thuja plicata foliage is a deep green and growth is uniform which eliminates most trimming and pruning. 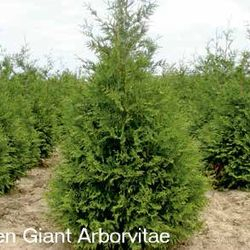 Green Giant Thuja plicata is one of the fastest growing plants you can find. Not only is it fast, the growth is dense – not some spindly stem shooting up with no width to it. Initial growth rates can be 3 feet in a single year, and growth is steady and fast. In trials at the University of Arkansas, it was the fastest evergreen they found, and tiny plants were 10 feet tall and 5 feet wide in just 7 years. These plants were single specimens – if Green Giant Thuja plicata are planted closer in a hedge the plants compete and push up taller, while staying narrower. Many other people report even faster growth, especially with a full fertilizer program, which we will describe later. 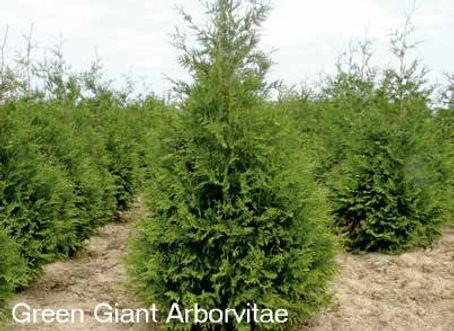 Green Giant Thuja plicata is one of the fantastic things about Green Giant Thuja plicata is its resistance to deer. Many evergreen– and many other plants too – are loved by deer, especially during the winter. If you live in an area with deer, this can be a real problem, and limit your ability to grow many beautiful plants. With Green Giant Thuja plicata you do not need to worry. This tree is widely known to be unattractive to deer and they will leave it alone. Only in very severe winters, and if you have many deer, can you have problems, and if you are concerned, just spray your plants with deer repellent in the fall. Even better, if you plant a double row of trees as described below, as the plants mature they will become so dense they will create a virtually deer-resistant barrier that will protect the rest of your garden, and allow you to grow a wide variety of beautiful plants.